A larger last minute gift with two trays of fresh-picked gourmet Florida Oranges and plump, sweet Ruby Red Grapefruit. 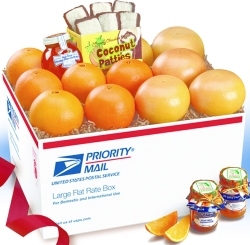 Your choice of fresh fruit only, or make it Deluxe with jars of Orange Marmalade, genuine Honeybell Marmalade and Orange Blossom Honey, plus a box of milk-chocolate dipped Coconut Patties. $18.85 Priority Mail shipping to continental U.S. and Alaska.